Looks like several Glendale-based vendors are joining forces for a posh little pamper night. Check it out! ‘Tis the season for shopping and saving – Two things that just so happen to be my specialties. : ) So, I put together this list of the best Black Friday/Cyber Monday Deals. Feel free to comment below if I missed anything you’d like to add. Happy shopping! 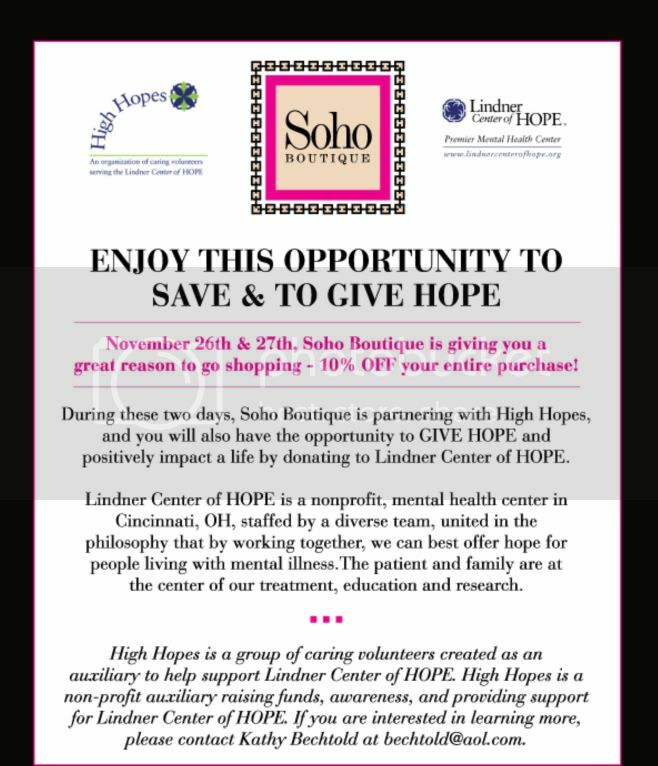 Last week on Cincy Chic, we covered several sales from Trend Boutique, OTR’s Gateway Quarter, Brush Factory, Karen Lindner Designs, Northside artists, Paris J Boutique, FENNOFashion, and Simplicity Salon. So, if you’re interested in shopping at any of those places, you’ll want to click here. Below is a list of more sales I found out about since we wrote that story. Cincinnati.com wants you to describe your neighborhood, and one person who takes the survey will win either $500 in cash and/or an iPad. Click here to learn more. Cincinnati Moms Like Me has an annual deal for the Nutcracker. This year, you can get 50% off for the Wednesday, 12/22, performance ONLY by using code: 1011NCMLM. For all other performances, use G1011CHIC for 20% off tickets. Click here to get your tickets. Moms Like Me has a couple other giveaways as well: Click here to win a $500 Deerfield Towne Center gift card, click here to win a 1,000 shopping spree in Downtown Cincinnati, and click here to win tickets to the Holiday Follies. At Snap Boutique, for every $100 spent, pick a stocking from their tree and receive up to 30% off your entire purchase Friday and Saturday. The Golf Exchange is doing deals on clubs/balls as well as 20% all golf bags Friday. 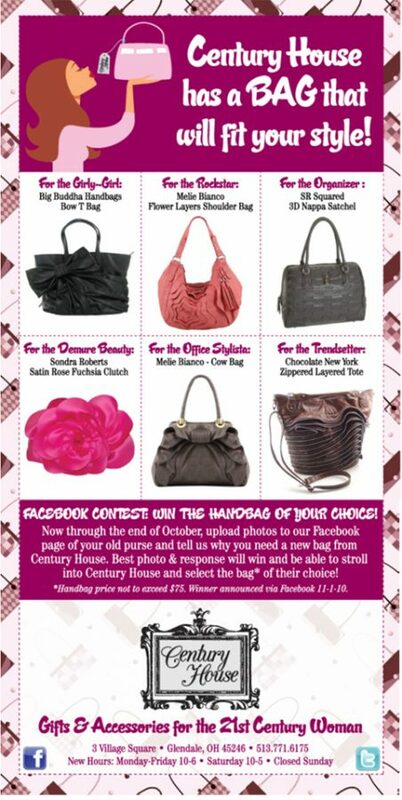 They’re also doing two ladies night shopping events to help women complete their holiday shopping in style. 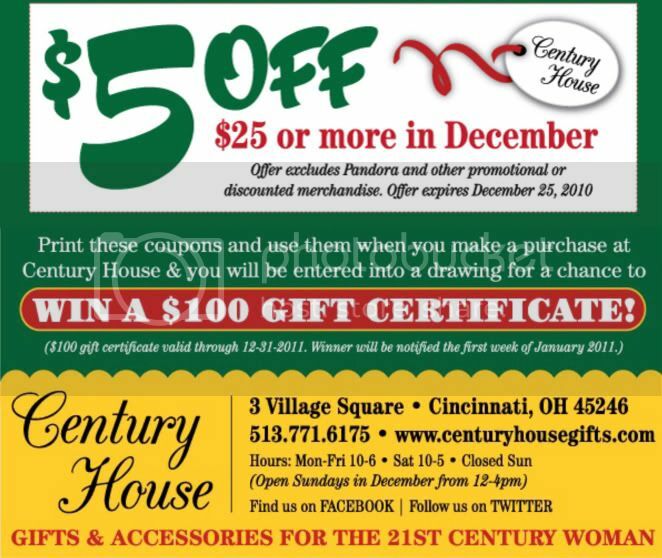 Click here to read the Cincinnati.com Savings Central blog about these deals/events. Actually, read all of Savings Central’s recent posts for good Black Friday deals/tips! Fetish in Hyde Park is doing 25% off Friday and Saturday. 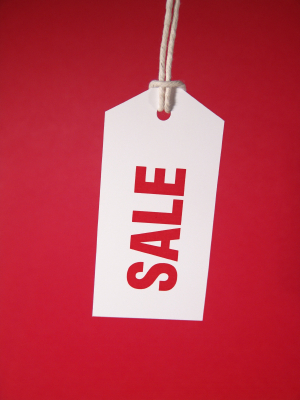 Click here and print this off to receive 40% any single item that is not on sale! 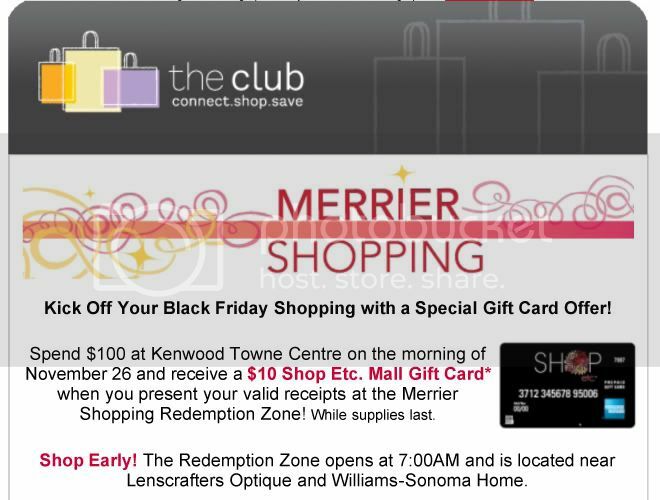 Kenwood Towne Center is giving you a $10 Mall gift card when you spend $100 on Friday. My husband and I did this last year and it was awesome! Not going to lie, we carefully calculated $100 expenditure increments and went back for several $10 cards… not sure if that’s legal but we did! : ) Click here to learn more details about this offer. Also, click here to see a comprehensive list of all the Black Friday sales going on at the Kenwood stores. 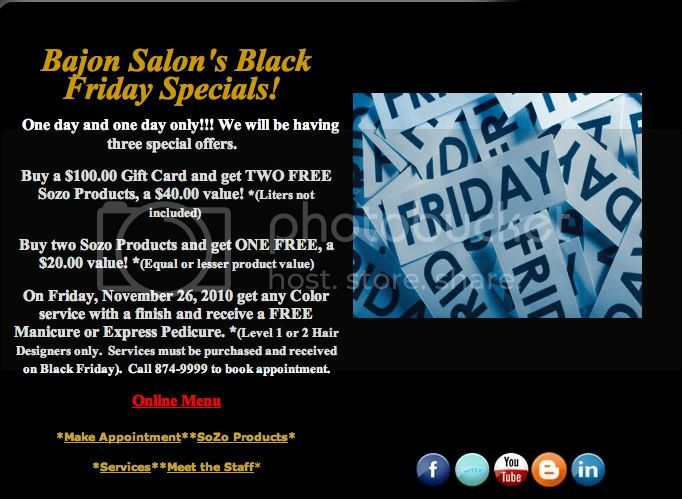 At Mitchell’s Salon & Spa, get 20% all services on Black Friday. They also have a sale on their gift certificates. Click here and get a $100 Gift Certificate for $80, $75 Gift Certificate for $60 or a $50 Gift Certificate for $40. At Bajon Salon & Spa in West Chester, they have all kinds of deals going on. One where you get free product when you buy a gift card and another where you get a free mani or pedi when you get a color service. Click here for details. Azhand Shokohi jewelry is 15% off online Friday only. And don’t forget about the Swap Shop sale going on at Park + Vine this Saturday. Peek of Chic is doing 15% off of everything on POC site on Monday only! Use coupon code “CYBERMONDAY” to get the discount! 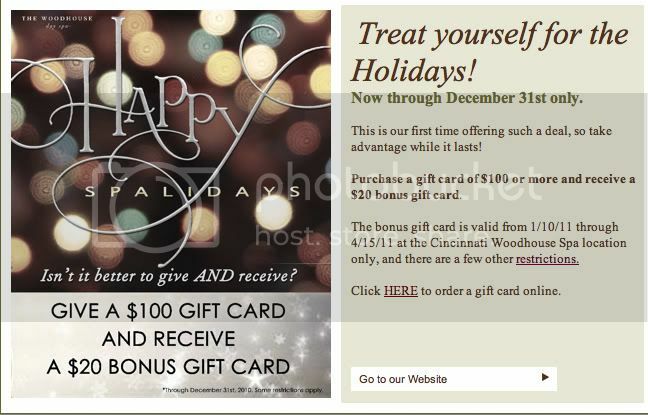 At Woodhouse Spa in Olde Montgomery, get a free $20 gift certificate when you buy a $100 gift certificate. You can print out the certificates on their site, which is nice. Click here for details. First there was Black Friday, then Cyber Monday… This year, there’s lots of buzz about the first-ever “Small Business Saturday.” Click here to learn more about it, but here’s the gist: American Express cardholders get a $25 statement credit when they shop at a small business on Saturday. Here’s a screen shot of the email I received so you can enter the contest too!